It avoids crashes on the Raspberry Pi 3 by fixing a previously undetected MOVS pc instruction. It appears that the Cortex-A53 faults these instructions; a change from earlier cores. There was a NULL dereference in the choices handling code when the user clicked on a pane containing hidden choices (those without a UI). This would cause a crash on zero page protected OSes. 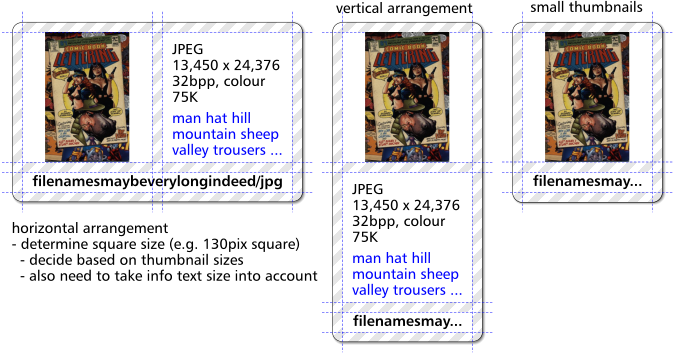 Additionally it was rebuilt using the latest DDE27 tools from RISC OS Open Ltd.
Tag Cloud – would let you label images and search for images using labels arranged in a Filer-like tag cloud. Thumbview – was intended to be like a souped-up PhotoFiler displaying larger thumbnails, image dimensions and labels from tag cloud. Canvas - was to be a multiple-image viewer window which would let you plonk images down side-by-side for comparison. … but there was insufficient time and inclination to get this stuff finished. Even though they’re compiled out you’ll find evidence of these features in PrivateEye 3.00 in the greyed-out options in Choices dialogue and in the Messages and the Sprites files. These features have were never finished so are disabled in this release. Although they do work to varying extents. If you’re sufficiently intrigued by the Tag Cloud idea then you can play with the Tag Cloud test application.